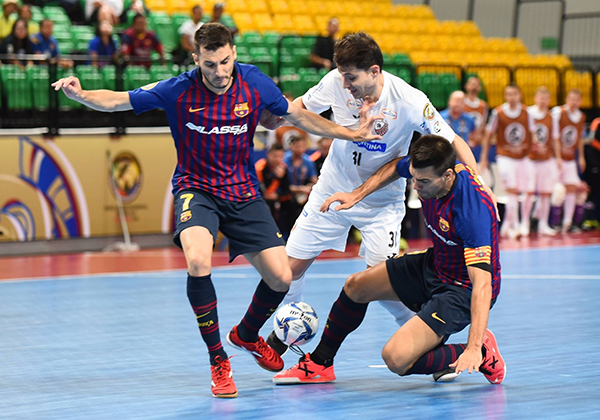 The penultimate day of the World Intercontinental Futsal Cup in Bangkok saw the semi-finals of the championships take place. In the first game Carlos Barbosa would look to make to the final for the second consecutive year as they faced FC Barcelona. It was a very tight affair with both teams having limited chances but it was the side from Spain that would strike first. Dyego cut in from the left wing and unleashed a low shot that whistled past both Douglinhas and goalkeeper Gian Wolverine before either could react. Carlos Barbosa’s intense man-to-man full court press was causing Barcelona problems and paid dividends in the second half when Darlan won possession off Boyis just outside the penalty area. He was able to slide the ball to Douglinhas for the equalizer. With less than 4 minutes on the clock that same defensive strategy would give them the lead when a deflected clearance fell to Valdin who passed to Le before he returned the ball as the goalkeeper was approaching. This left captain Valdin with a simple finish to make it 2-1. Barcelona had the chance to level the scores when a 6th foul for an unfortunate handball resulted in a 10m penalty. However, Sergio Lozano’s shot was saved by the goalkeeper Henrique who was brought on exclusively to defend the penalty. FC Barcelona used the fly goalkeeper to create some reasonable opportunities but with 17 seconds left on the clock they lost possession, and their hopes of becoming world champions with it, as Bruno Souza dribbled the ball into the empty net. 3-1 was the final score. In the second semi-final 9,000 fans packed the arena to see local team Chonburi Bluewave try to overcome the holders Magnus Futsal. From the start both teams were creating good chances and it didn’t look like it would be long before one of the teams would take the lead. Leandro Lino, one of the star performers of the championships so far, found space on the edge of the area after a quick drop of the shoulder to lose his defender and found the finish to open the scoring for Magnus. Chonburi missed several great chances but they finally took advantage when Ronnachai hit a fierce strike to even the scores. They weren’t level for long. Just 10 seconds later poor defending at a free kick left Marcel alone at the far post and he put the ball between the goalkeeper’s legs to restore Magnus’ lead. Both teams continued to create but a combination of poor finishing and outstanding goalkeeper was preventing either team adding to their tally. Chonburi regained parity a few minutes before half-time from a free kick when Kritsada was found at the far post and he sent the ball into the roof of the net. They would go into the break with the lead after winning possession high and launching a counter attack for Nattawut to make it 3-2. Magnus started to dominate and push Chonburi back including by bringing goalkeeper Thiago, and afterwards fly goalkeeper Leandro Lino, forward to create an overload. However, goalkeeper Senbut was in inspirational form. It was four-time World Player of the Year Falcao that got his team back level after receiving the ball on the right wing and calmly slotting the ball in the far corner. Magnus continued the same strategy after the goal and were forcing Chonburi back. Magnus found the winner after a scramble for the ball fell kindly to Rodrigo who was able to lay it off to Marcel for a simple tap-in that broke the hearts of the home crowd. Chonburi were unable to create anything of significance in the 90 seconds that remained and Magnus ended 3-2 victors. The final day of competition will see Chonburi take on FC Barcelona for third place and a repeat of the final from the last edition means Carlos Barbosa have an opportunity to get revenge on Magnus in the battle to be champions of the world. On Matchday 4 Club Atletico lost out on 5th place to Elite Futsal who beat them 2-1.